Company Surge® aggregates the content consumption activity of millions of B2B organizations and informs you when target organizations are indicating active demand for your products or services. Visit the Company Surge® one pager for more information. How can I access Company Surge®? What can I do with my Company Surge® report? How do I create a Company Surge® report? What is the maximum number of domains I can upload for a Company Surge ® report? What is a Company Surge® Score and what factors are used to calculate it? What is the Metro/State/Country composite score? How do you derive the domain and location of the Surge? How do you track people across the B2B Data Co-op that log on and off multiple devices or use VPNs? How do you associate content with the topics in your taxonomy? How do you suggest topics with the topic recommendation tool in Company Surge®? 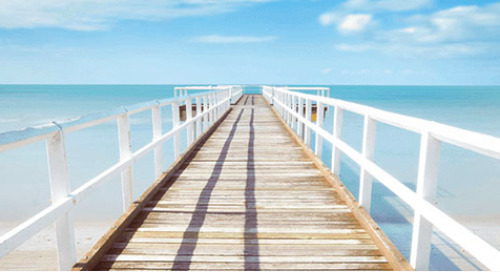 How often do you refresh the data for Company Surge® reports? How do I activate my Company Surge® data through digital or programmatic channels? What is an 'Always-On Surge' segment and how do I activate it through digital or programmatic channels? What if there is a topic that I want to monitor that is not on the list? What is the process for adding topics to the taxonomy? What is Bidstream data and how is it different than the Intent data that Bombora captures? Does Bombora use Bidstream data? 1. What is a 'Surge'? A Surge is when a company exhibits an increased level of research activity or content consumption compared to its historical baseline. Companies 'surging' on certain topics are strong indicators of purchase intent or interest in certain products or services. 2. How can I access Company Surge®? 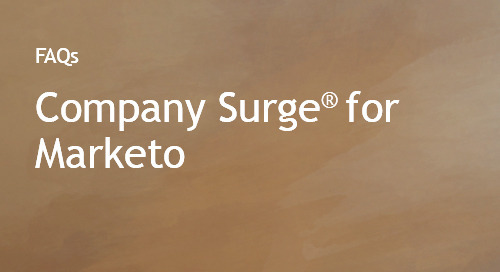 Company Surge® can be accessed through the Bombora user interface, as a data feed, through an API, or through one of our partner integration, such as Marketo and Salesforce. For access to any of the above, please reach out to your Bombora account contact. For more information on how to use the user interface, please reference the Company Surge® User Guide. The data feed is available through an SFTP. To understand the data output from the data feeds, reference the Master Company Surge® Data Dictionary. For more information on how to integrate with our API, please review our API documentation or speak with your Bombora account contact. 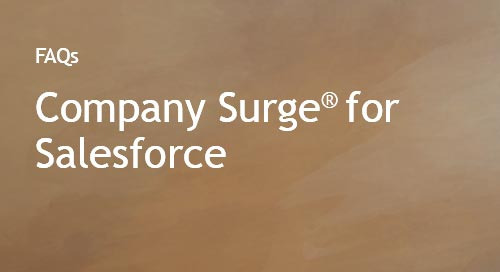 Company Surge® data can also be accessed directly in your Salesforce CRM through our direct integration. For more information, please visit our Salesforce AppExchange listing or speak with your Bombora account contact. Additionally, numerous partner platforms have direct Company Surge® integrations. 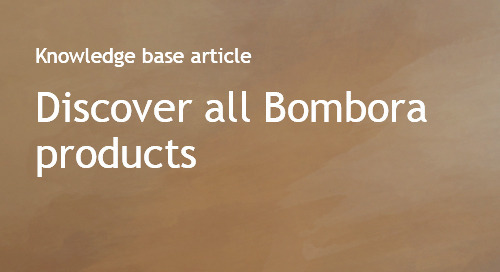 Please speak with your Bombora representative to discover which partner will best suit your use case requirements. 3. What can I do with my Company Surge® report? There are many ways to get value out of your Company Surge® reports across your marketing and sales initiatives. a. Digital advertising - Increase efficiency and efficacy by building audience segments based on business name, location, size, functional area, seniority, and most importantly, intent. Integration with the industry’s top programmatic platforms means seamless execution, and no added legwork. Coordination with sales ensures ads are shown to the same target prospect accounts that they are calling on. b. 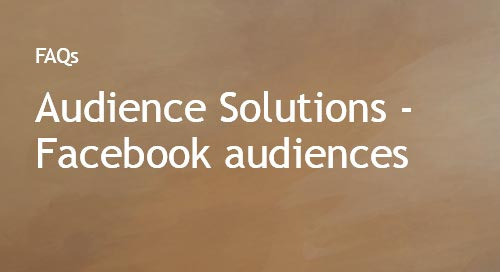 Social Account-Based Marketing - Built around increased content consumption against a historical baseline, Company Surge® tells you which topics are most relevant to your target organizations. Create a social Account-Based Marketing (ABM) strategy based on the topics that your target audience is consuming across the entire B2B web. This insight can drive editorial planning and ABM success. c. Content syndication and lead generation - Drive downloads and generate leads from Bombora’s pre-qualified and active accounts. Syndicate your topically-relevant content through platforms that can target specific accounts and decision makers that are in active research mode. By capturing users at organizations that are consuming content relevant to what you sell, you increase the chance for successful engagement and ultimately, a purchase. 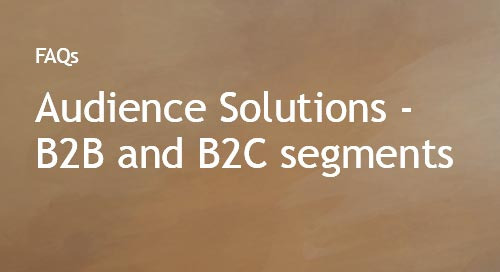 d. Marketing automation - Segment marketing lists by business topics that reflect what your recipients are researching. 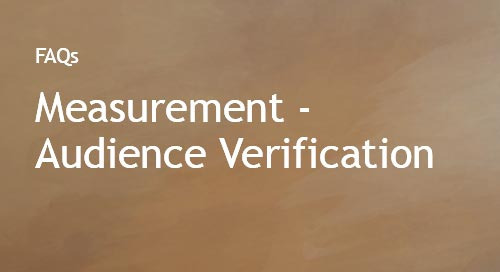 Apply a Company Surge® Score, which incorporates the strength of business intent and various behavioral signals, to personalize your messages on the account level. The Company Surge® Score updates weekly to reflect increasing or decreasing interest, so you can adapt your message accordingly. Enrich email lists with active intent signals, and email less often and more effectively to drive engagement, retention, and acquisition. e. Sales prioritization - Submit a comprehensive prospect list, and in return, get a list of accounts to contact immediately, based on their recent online content consumption and behavioral intent signals. Know which accounts are researching topics related to your products or services before they even make it to your—or your competitors—website. View account-specific Intent data by metro area as well as the topics that might resonate with businesses in that area. Learn more about how Cloudera uses Company Surge® reports across sales and marketing initiatives. Watch the video. You can create a Company Surge® report directly in the Bombora interface, via our API, or work with your Account Manager. The maximum number of domains that can be uploaded in the API or the UI is 1,000,000. 6. What is a Company Surge® Score and what factors are used to calculate it? 7. What is the Metro/State/Country composite score? Similar to the Surge Score, Bombora also tracks the intensity of content consumption activity for specific office locations, specific to metro area, state, or country. For example, you may see Company X with a Surge score of 65, but their office location in the NYC metro area may have a score of 80, if it is demonstrating a significant increase in research activity for a particular topic. 8. How do you derive the domain and location of the Surge? Bombora identifies the domain of a device that visits a page in the B2B Data Co-op through a proprietary domain assignment process. Our one-sheeter below provides more information on the methods we leverage to identify the company of a device. Typically we can associate a domain to a device ~20-30% of the time. We derive location from the IP address. 9. How do you track people across the Data Co-op that log on and off multiple devices or use VPNs? For remote employees that access a business' computer network through VPN, it is typically best practice to have the employee's VPN connection under the corporate IP address due to security risks. In this scenario, a geographic activity may be skewed to the location of the VPN server, but identification of the business activity will be based upon the connection back to the business IP network from any remote workspace in the world. 10. How do you associate content with the topics in your taxonomy? We actively monitor 5,000+ B2B topics in our taxonomy. When a topic is added to the taxonomy, i.e. cloud security, we use machine learning to train our models using hundreds of relevant content pieces that focus on cloud security to identify the context and patterns associated with that topic. When content is consumed across our Data Co-op, our technology scans the page and scores the relevance and density (i.e. is the topic the focus of the content piece or mentioned briefly) of the content against our topics. Beyond simply scanning for keywords, it also considers the greater context of the page (i.e content about Facebook is also associated with social media). It then associates the content piece to all of the appropriate topic(s). 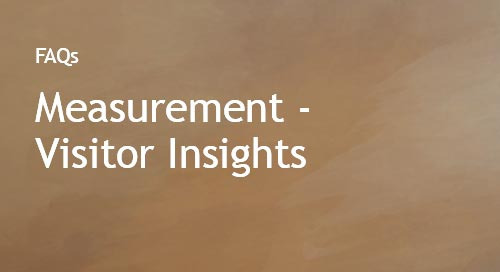 Learn more about why our topics are different from other Intent data vendors' 'keywords'. 11. How do you suggest topics with the topic recommendation tool in Company Surge®? We create an internal similarity score for each topic, and the order of topic suggestions are sorted by that score in the resulting list. Please click here for a list of the topics in the Bombora taxonomy. 12. How often do you refresh the data for Company Surge® reports? Data is being captured in real-time. However, the data for Company Surge® is refreshed on a weekly basis and new data becomes available every Monday. 13. How often do you update your topic taxonomy? We're continuously evaluating updates and improvements to our taxonomy. We update our topic taxonomy every 1-2 months. To download our most updated taxonomy, please visit www.bombora.com. 14. How do I activate my Company Surge® data through digital or programmatic channels? 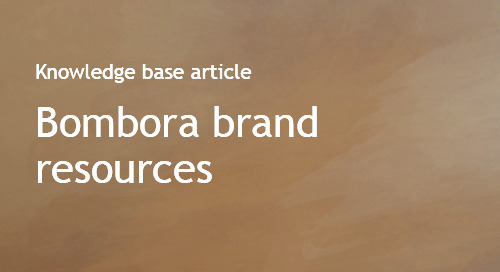 Once you've created a Company Surge® report and have a targeted list of companies actively researching topics relevant to you, you can easily create a digital audience segment to activate across digital or programmatic channels directly from Bombora's interface. This can be done with our Digital Audience Builder product. 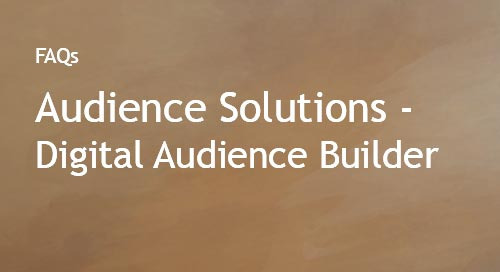 If you do not have access to Digital Audience Builder, please reach out to your Bombora account contact. Refer to the Digital Audience Builder User Guide for the steps on how to do this. 15. What is an 'Always-On Surge' segment and how do I activate it through digital and programmatic channels? 16. What if there is a topic that I want to monitor that is not on the list? We're consistently evaluating updates to our topic taxonomy to reflect customer suggestions and industry trends. If there are topics that you're interested in that are not included, please complete a short survey with your suggestion. 17. What is the process for adding topics to the taxonomy? We consistently review topic suggestions from our customers and from market trends to add to our taxonomy. 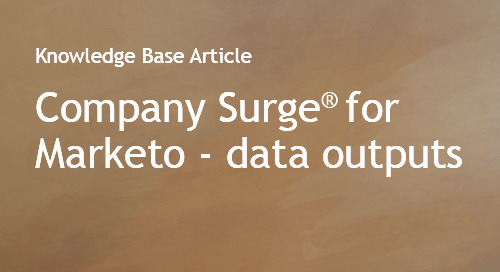 When a new topic is suggested, it typically takes 6 to 9 months before Company Surge® data can be associated with it. While we strive to add as many topics suggested by our customers as possible, we cannot guarantee the feasibility of any topic suggestion. · Reviewing all topic suggestions and determining its viability based on its similarity to existing topics, granularity, definability, and clarity. · Approved topics are sent to a content team which finds a minimum of 80 pieces of content per topic in order to train our topic classification engine. 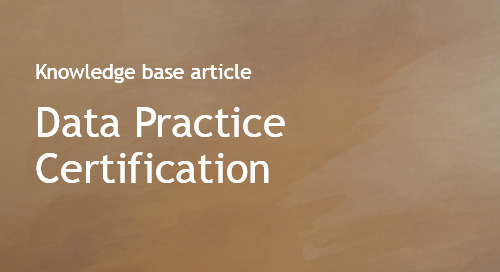 · Our Data Science team must train our topic classification engine on the new topic. 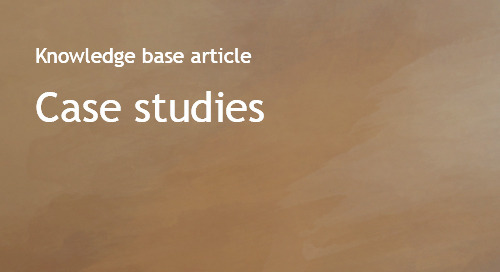 · It takes an additional 13 weeks to build a baseline on a given topic for Company Surge®. · From there, our Company Surge® customers will be able to leverage the new topic taxonomy. 18. What is bidstream data and how is it different from the Intent data that Bombora captures? 19. Does Bombora use Bidstream data? Bombora’s direct measurement method, and relationships with business sites, is more comprehensive than relying, as Bidstream does, on data derived from only pages that have RTB inventory. By having direct relationships with publishers and B2B sites, Bombora is able to deliver value back to these owners in exchange for their data contribution. Use of Bidstream data beyond RTB is forbidden by Supply Side Platforms (SSPs) and Demand Side Platforms (DSPs) (such as Google, AppNexus, Amazon, Rubicon and OpenX), according to Ari Paparo, Founder and CEO of DSP Beeswax, in the AdExchanger article, 'Everything You Need To Know About the Bidstream', published on March 7, 2019.